Keeping the Pounds Off! : Chicken Waffle What? Potatoes, thinly sliced, deep fried and slathered with sodium and chemicals. This does not sound appealing but how many of us have consumed entire bags of potato chips and other chips? I know I have eaten more than my share of the cheesy kind, the nacho kind, the vinegar kind, the sour cream kind - and the loaded kind. It has been a long time since I had flavored or even plain potato chips. Recently I ate my dinner sitting next to a friend who was eating her dinner. I did not pay any attention to what she was eating because I had my own dinner to enjoy. She turned to me to talk and I realized by her breath that she was eating potato chips. The smell caught me off guard. I have not smelled 'chip breath' in a long time. It was both repulsive and enticing. Such is the mind of the food addict. 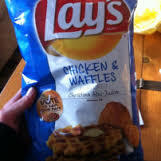 Even hear of Chicken and Waffle Lays Potato Chips? I heard of this product more than six months ago but never saw it in the stores. I was intrigued. Mind you - I have never in my life had the meal 'chicken and waffles." so I do not know why I found this product worthy of space in my brain. Thinking back now I do not know why I ever thought it would be something to try. This week I saw it on the shelves in Publix and ignored it - twice. On the third visit I picked up the package and read the label. The third ingredient is something called 'chicken and waffle flavoring'. The first ingredient of the flavoring is brown sugar. I did not buy the chips. I don't even want a taste. I am not beating myself up for looking. There is no value in it. My shopping cart was filled with vegetables, fruits, meats, fish and the occasional paper or cleaning product. None of these foods will go to waste in my home. None will go to my waist. I would like to know what will they think of next to tempt the consumer who does not want potatoes; sliced, fried and covered with sodium and chemicals. I want to make sure to fortify my protective barricade against a breech by the snack makers. Chicken and waffles... I don't even know what to say about that combination of "real" food. Thinking about chowing down on a bag of chips--- throw in some hellevagood french onion dip---- now THAT sounds like a fantastic evening. I don't know why though. WHY is that "tasty"? Why do I crave such things? Why dies my brain tell me that I want these things? Someone got a "free" sample and was passing them around an office at work- Yuck! Nasty. More junk food. It's not even food, it's processed product. I have never understood that combination! Yuck. I am. Thank you for asking Vickie. I have been busy at work this whole month (had a banner work month which is a good sign for the economy) and tomorrow I leave for a drive up to Cleveland and Akron to visit some people I know and meet some new people when I get there.